Let’s be honest, not many people periodically open their computer up to give it a thorough cleaning. And i discourage you from opening up your computer if you’ve never done so before and/or don’t know what you’re doing but it is important that it gets done at some point. Two of a computer’s worst enemies are heat and dust. We all know a computer has fans to keep the temperature under control but why? 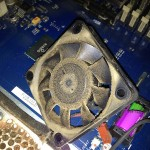 We all know a big blanket of dust over the components is probably not good but why? These are not questions many people ask, they just accept it is the way it is and as long as it works they don’t really care. Fair enough. In case you do want to know why heat and dust are not good for your computer, read on. Dust, dander, hair, tar (smokers) and whatever happens to float around near your computer gets sucked in by the cooling fans. 90% of what gets sucked in also gets blown out by the exhaust fans but something always gets stuck inside your computer, always. Over time all this stuff builds up on your fan blades, heatsinks, circuitry and parts which will prevent your computer and all it’s components from getting the cool air they desperately need. Your fans will start to work harder, your computer will get noisier and the overall lifespan of your components can reduce significantly. With the computer running hotter, this layer of dust can turn into a sticky, pasty layer that can very well conduct a current which in turn can cause a component to short out (this can be visible or just a small cluster that’s not visible to the human eye). I’ve seen many Macs fail because of it, Macs that could have gotten many more years of use out of them if they had been kept clean. 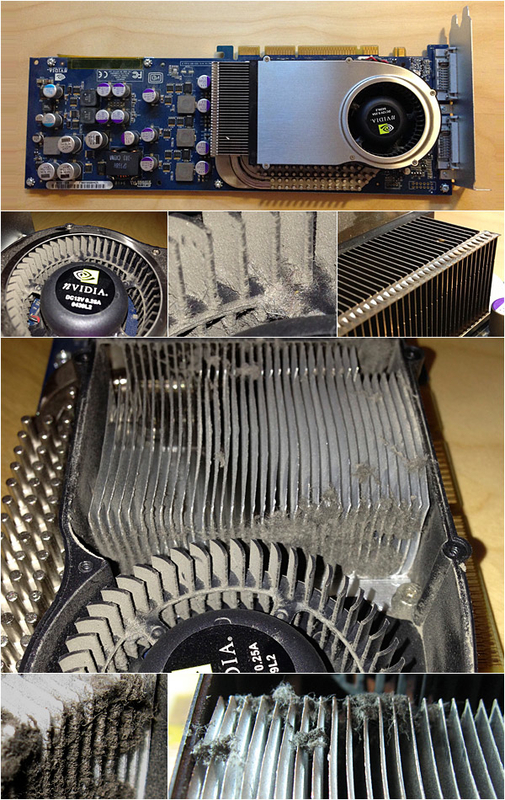 If you can, open your computer periodically to clean it out, use compressed air and/or an antistatic brush to get the dust out from wherever you can. Even if you do not get all of it, just loosening it up can help as the computer’s fans will blow it all out next time you turn it on. NOTE: Do not open up components of your Mac like this! This was done on an out of warranty system for demonstration only. As you can see it is far worse on the inside of the card than it is on the outside. 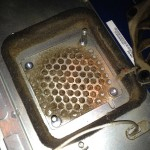 Almost 60% of the heatsink fins are clogged up with dust, air can’t flow between the fins on almost all of the right side. This will cause the graphics card to run hotter, the fan to spin faster/louder and may cause damage to the card (if it hasn’t already). Front of the G4, one of the bottom air intakes. No air was coming through there! 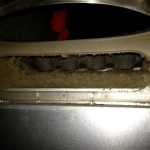 Side air intake, same problem. Fan was stuck in the goo, it no longer spun. Once it was cleaned luckily it worked again. Unfortunately the damage to the power supply and graphics card was done, they both had to be replaced. In this case since it’s an old Mac, used parts were fairly cheap and easy to come by so after the parts were replaced he was up and running again. I have seen this on Mac mini’s, G5’s, Mac Pro’s and MacBook Pro’s, this can happen to any computer. Are you willing to pay a couple of hundred bucks for a new power supply, graphics card or processor? If not, then keep your computer clean 🙂 Keep in mind that warranty usually does not cover this (even AppleCare). A follow-up post was done specifically for Mac Pro users, it can be found here. Hard Drive: I’ve done some checking on different brands for both laptop and desktop hard drives and in general they all have an operating temperature of 0-60°C (32-140 F). If 60°C is the maximum temperature set by the manufacturer it’s a good idea to make sure your hard drive never reaches that temperature. When idle my hard drives average out around 36°C (96.8F) and when actively used under average-high load as high as 44°C (111F). I keep my office cooled to a fairly constant 24.5°C (76F). So for the hard drives this is within the range specified by the manufacturers. Note: An almost full and/or very fragmented hard drive will have to work much harder, causing additional wear and heat. Keep your hard drive tidy and leave enough free space available. Processor(s): Processors generally give off a great amount of heat. As they are built to be faster and more powerful every day they are also designed to be more energy efficient so the heat a processor gives off has been pretty steady over the last few years. It’s hard to pull up specifications on processors and know exactly which temperatures your chip can handle, you have to find out what kind of processor your computer uses and find the specifications on the manufacturer’s website. In my case the maximum temperature for the 6-Core Xeon is 81.3°C (178.3F). When idle the processors average out around 50°C (122F) which is about as high as i want it to be at most. When under average-high load i’ve seen it as high as 74°C (165F) which is much hotter than i’d like. A processor that runs too hot will experience calculation errors which can result in error messages, kernel panics, weird and unexpected behavior and data corruption. The computer can unexpectedly shut down at random times in an effort to protect itself from literally burning up. While every processor brand and model has a maximum temperature at which it has been tested and found reliable, it’s a good idea to stay way under this limit. In my case i often come pretty close to this limit. RAM: (Memory) has a lot to endure and heats up as a result. RAM comes in many different sizes, brands, models and speeds and it is hard to figure out exactly which your computer is using. To get exact specs from the manufacturer you usually have to do some digging, look at the physical RAM modules to see if their labels give you a model and vendor then do research online. In my case i found the RAM in my Mac Pro has a max of 80°C (176F) but this could be lower/higher for you. When idle i found the RAM modules to average out around 50°C (122F) and when under average-high load as high as 60°C (140F). Not pushing it but still pretty toasty. RAM that runs too hot can result in slow performance, data corruption and system instability. Graphics Card(s): Located in a PCI or AGP slot if you use a tower, directly on the logic board and/or the processor if you use a laptop and attached to the logic board via PCIe connection in iMacs. However and wherever it may be connected, your computer has a graphics card and graphics cards have become very powerful parts of the system. As such they can give off a great deal of heat. It’s usually hard to find specifications on graphics cards unless they are sold as separate parts but generally you do not want your card running more than your average system temperature. If we take the numbers above i’d expect my graphics card to run anywhere between 50 and 70°C. Pretty hot. In reality while idling the temperature is around 60°C (140F) and when under average-high load as high as 85°C (185F). I was not able to find exact specifications on my graphics card but i know that it can handle up to 100°C (212F) for a very short period of time so i am guesstimating the safe maximum temperature to be 90-95°C (194-203F). Either way, my graphics card runs much hotter than i’d like to see it run. Power Supply: A separate module in desktop computers and an external adapter for laptops. This topic is for desktop users only but for laptop users, do keep an eye on the adapter of your computer, if it is too hot to touch or hold something is usually not right and should be checked out. The power supply on a Mac Pro will run hot even when idle. I find an average temperature of 81°C (177.8F) with iTunes playing a track and Safari open to write this post. Under average-high load i have seen 95°C (203F). A power supply that runs too hot can result in unexpected shutdowns and can possibly pass irregular power to the system’s components causing damage throughout the machine. By using smcFanControl i can regulate the temperatures inside my Mac and possibly keep my system in good shape longer. By increasing the speed on some of the fans i am able to reduce all of the above mentioned numbers a great deal, usually below the idle temperatures, and i can still barely hear the fans run. By using applications such as Hardware Monitor or iStat Pro you can keep an eye on the temperatures the various system components give off and adjust fan speeds accordingly. Or just make a few presets in smcFanControl so you can easily apply them later. I have presets set for video encoding, password hash cracking, defragmenting drives etc. Overall i try to make sure there is not a single component that goes over 60°C (140F) and if a component does reach or exceed a certain temperature, i have Hardware Monitor give me a notification and i can adjust my fan speeds accordingly. It sounds like a lot of work but it really isn’t. I have my default fan speeds set in a way that i rarely need to adjust and when i do, a preset is just a mouse click away. Am i too paranoid my beloved Mac will die before it’s time? Possibly. Can it hurt to keep your computer clean and cool? Absolutely not. Better safe than sorry. The MacBook Air has just one fan but a slight adjustment still makes quite a difference. Find out as much as you can about your system and it’s internal components, find out the temperature ranges set by the manufacturer and see if you need additional cooling and what the best settings may be. It may very well add a few years of life to your computer! Also familiarize yourself with the design of your computer, see where the air intakes and exhaust are and keep the areas around them clean and clear of dust and other things that can obstruct airflow. When it comes to getting the dust out of your computer, be very careful. Use the right tools if you plan on doing this yourself or contact a store / service provider that can do it for you.